This blue shark was photographed off of Catalina Island in open ocean. It took us five hours of chumming when finally this little blue showed up. To photograph this sleek swimmer, I used a Nikonos V with a 15 mm lens set at f8, and a single Ikelite Sub Strobe Ai. About the Blue Shark: Blue sharks are found world wide and are named for their iridescent blue coloration. The blue shark eats garbage (they are makeshift scavengers)and also fishes and squids. They tend to come in close to the shoreline on occasion and are efficient swimmers on the surface. Many consider the blue shark to be the puppy dog of all sharks. They are not normally aggressive toward humans. 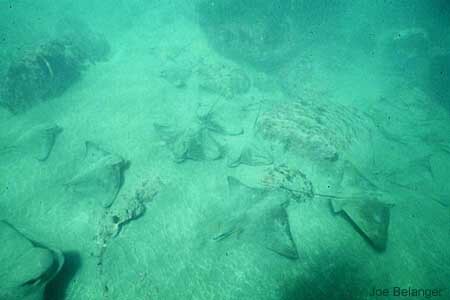 These rays were photographed in shallow water at Santa Barbara Island. This is an available light photograph (no strobes used). Shot with a Nikonos V and 15 mm lens set at f11. About the Bat Ray: Commonly found in shallow water, particularly in muddy and sandy bays. Very shy animal and will swim away quickly at first visual contact with divers. Range from Oregon to the Gulf of California. Size to about 6' (2 m). Photographed at Johnson's Rock, Catalina Island. Our dive boat, Encore, was floating in clear calm water when I looked up and saw its name. So I snapped a picture or two and gave a copy to the boat owner. 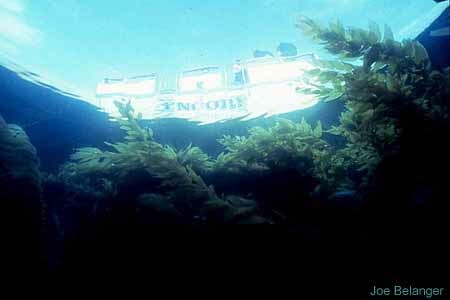 About the dive boat: Encore is one of California's best dive boats. It won the 'Rodales Day Dive Boat of the Year' award in 1996. Very large galley, bunk area and there are three heads for those divers who refuse to admit that they urinate in their wetsuits. About the area: On a very calm day, I went to dive in shallow water (3 to 5 feet) at Catalina's Bird Rock. It was a beautiful and serene dive. There is so much to see if you have the chance to dive shallow. 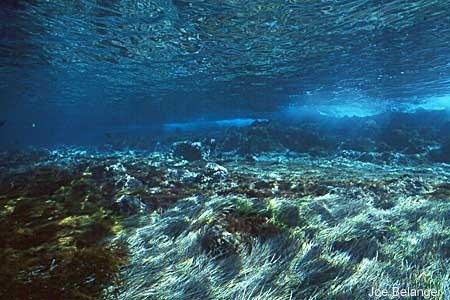 Many divers overlook this kind of beauty because they choose depth over shallow terrain. 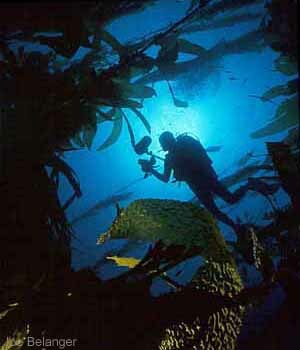 When I peered through the kelp, I saw my friend Eric looking for a subject. As he glided through the giant forest, I saw an opportunity to take a good interactive picture. About Giant Kelp: Found world wide in waters averaging 50 to 60 degrees. The giant kelp grows at a fast rate of up to two feet per day!! They are kept afloat by gas filled bladders, while the plant base is mounted to a secure substrate by root-like structures called holdfasts. Giant kelp grows to more than 100 feet.